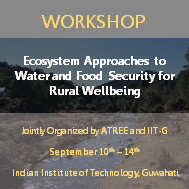 This 5-day workshop jointly organized by the Ashoka Trust for Research in Ecology and the Environment (ATREE) and the Indian Institute of Technology – Guwahati (IIT-G) delves into various natural and social science concepts in the field of ecosystem and wellbeing assessments. The workshop will link ecosystem services, food and water security, environmental change and the dynamics of rural systems to understand and enhance the wellbeing of rural communities in the Eastern Himalayas. Training will be imparted through a combination of lectures, discussions, field exercises and intensive group projects. Results of the group projects will be compiled into a discussion paper which will be published in the ATREE’s Environment and Development discussion paper series. Current post-graduate students, early career professionals working with non-profits, government agencies, research institutions and academic centres in Northeastern India. We hope to maintain an age limit of 35 years to ensure a certain level of experience, and so that participants gain the most from the programme. Have an understanding of the diverse eastern Himalayan ecosystems, the environmental changes they are undergoing, and the impact of these on ecosystem functions, services and human wellbeing. Learn certain natural and social science concepts and methods to assess ecosystem services and their social benefits. Develop strategies to facilitate rural wellbeing through sustainable use of natural resources and ecosystem services. Gain knowledge on the wellbeing, consequences of climate change on ecosystem services as well as natural resources. Gain knowledge on how ecosystem-based conservation can be implemented and practiced on the ground for human benefits. Faculty from ATREE and IIT-G will lead the lectures and training sessions. Deadline to apply is 20th August, 2018. Selected applicants will be notified directly by 27th August, 2018. Our decisions will be final. There is no fee for the workshop. All participants will be reimbursed for travel from their departure location to the IIT-Guwahati campus, and back (train (3AC), bus, shared taxi). Accommodation at the IIT-G hostels and food will be covered. Stationary and equipment for the field exercises and mini-projects will be provided by the organizers. For more information or queries, please contact Rubin Sagar (rubin.sagar@atree.org).